West of England Mayor Tim Bowles welcomed the new sector deal between the aerospace industry and government – including a direct £15 million investment in the region – announced by Business Secretary Greg Clark in the West of England today (6 December). At a major government event in Bristol with businesses, researchers, civic leaders and industry representatives to mark the first anniversary of the modern Industrial Strategy, Mr Clark announced new support for the UK’s leading aerospace sector and the next generation of transport to tackle ground congestion and pollution in towns and cities. The Business Secretary recognised the West of England as being synonymous with industrial innovation and creativity, and visited the Bristol Robotics Laboratory – one of the key examples of technological advancement in the region. Regional Mayor, Tim Bowles, said: “I was delighted to welcome the Secretary of State to the region today to announce this major investment which builds on our Local Industrial Strategy. The Secretary of State and I both recognise that the West of England is at the heart of innovations driving the world. We lead the way in so many sectors; from aerospace to advanced manufacturing, creative to robotics, finance to food, we are perfectly placed to drive innovation and growth here in the region, setting the direction for our economy and pushing for future growth for the UK and the world. £15 million government investment for GKN Aerospace’s new Global Technology Centre in Bristol. The centre is expected to open in 2020 and will ensure the UK is a hub for world class innovative technology for the next generation of fuel-efficient aircraft. A multi-million pound package of new investment to turbo-charge UK industry in support of the modern Industrial Strategy and put the UK at the forefront of the industries of the future, including up to £125 million from the Industrial Strategy Challenge Fund to develop future flight – including electric planes with vertical take-off capability, goods and service drones, and autonomous aircraft. The new government-industry Aerospace Sector Deal which includes support proposals for supply chain SMEs to boost their competitiveness on the global stage and a pledge to increase the number of women in aviation. Greg Clark said: “Our modern Industrial Strategy is the government’s long-term plan for preparing and investing in our post-Brexit economy. And I could be in no better place than Bristol to mark this first anniversary. It is an honour to be visiting a city that has been at the heart of British industrial innovation for centuries. “Bristol still exerts this influence. You can see it in the world-leading advanced manufacturing plants of GKN, and the global cultural impact of animation companies like Aardman. This region is at the heart of innovations driving the world. “The UK’s contribution to the global aerospace industry cannot be underestimated. But we are not complacent. The future of aerospace is cleaner, greener, and more efficient, and we want the UK to be the pioneers of new technology that will pave the way for increased electrification and autonomy in commercial aviation. 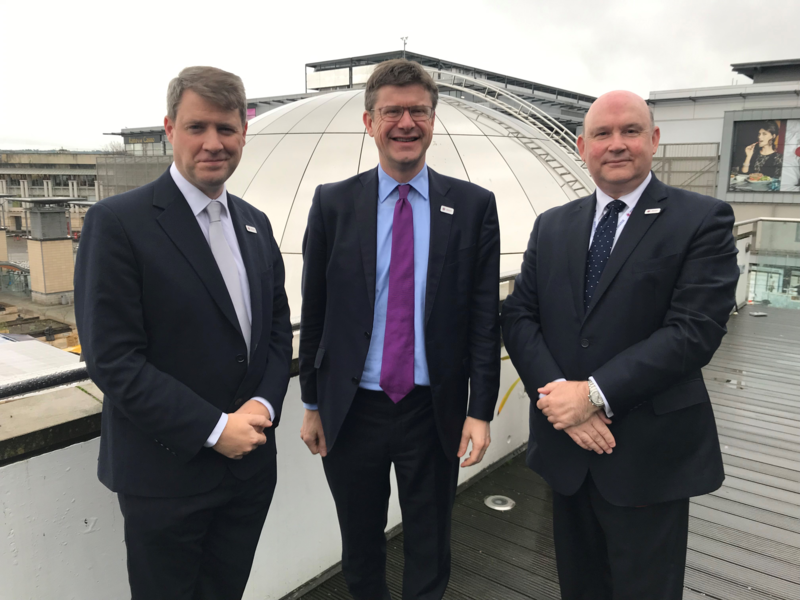 Photograph (left to right): Chris Skidmore, Minister for Universities, Science, Research and Innovation; Greg Clark, Secretary of State for Business, Energy and Industrial Strategy; and Tim Bowles, West of England Mayor.